Regardless of the size, theme, venue, time of day or season, A Special Event can make “the big day”– your wedding and wedding reception — a special event that you and your guests will long remember. Put A Special Event to work and eliminate your worries. 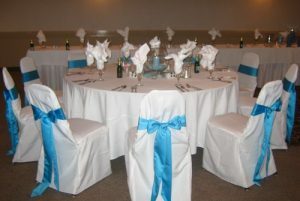 Our complete service enables you to fully enjoy your wedding reception. We’ll do as little or as much as you require…from a simple drop-off, to handling the complete set up and breakdown, quickly and efficiently. We offer a wide range of tent sizes, over 50 color choices for tablecloths and linens, dancefloors and furniture — every thing you can imagine for an enjoyable wedding reception. Use our Wedding Checklist to organize your bridal function, then give us a call. We would love to serve you. If you are planning a wedding, reception, rehearsal dinner or event in Raleigh, Durham, Cary, Chapel Hill, Apex, Wake Forest, Garner, Fuquay-Varina, Zebulon, North Raleigh, Morrisville, Holly Springs, Clayton, Sanford, Fayetteville, Lillington, Southern Pines please be sure to let us know. Request An Estimate on our services, Contact Us to get feedback on your ideas, or call us 919-557-9696 to make your wedding reception A Special Event.